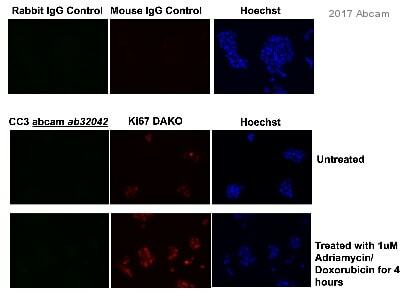 Mouse, Rat: We have preliminary internal testing data to indicate this antibody may not react with these species. 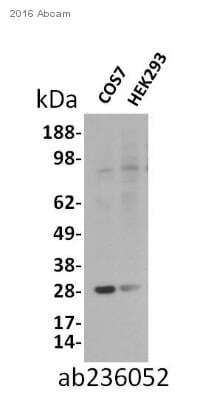 Please contact us for more information This antibody only detects the active (cleaved) form of Caspase-3 and does not recognize the pro form of Caspase-3. PubMedID 19789217 describes the detection of human cells injected into mice. 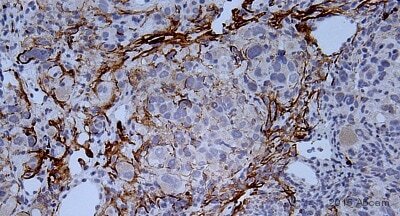 The pro-caspase-3 is cleaved only when apoptosis event occurs. 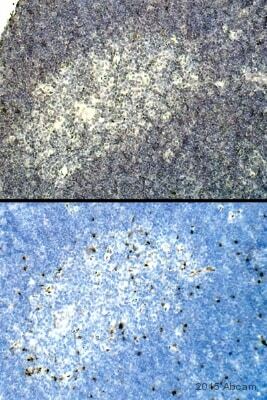 So, in order to detect active Caspase-3, we strongly suggest to induce your samples into apoptotic pathway. Synthetic peptide within Human Cleaved Caspase-3 aa 1-100 (N terminal). The exact sequence is proprietary. A synthetic peptide corresponding to residues following Ser29 of human Caspase 3 (N terminus of p17 subunit). WB: Wild type HAP1 + 2uM Staurosporine (ab146588) for 24 hours, whole cell lysate; Jurkat cell lysate (camptothecin treated); HeLa cell lysate (staurosporine treated). ICC/IF: Hela cells (staurosporine treated); Human Vascular endothelial cells. Our Abpromise guarantee covers the use of ab32042 in the following tested applications. WB 1/500. Detects a band of approximately 17 kDa (predicted molecular weight: 32 kDa). 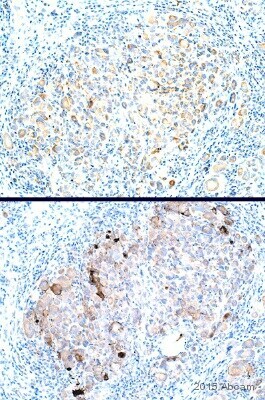 The pro-caspase-3 is cleaved only when apoptosis event occurs. 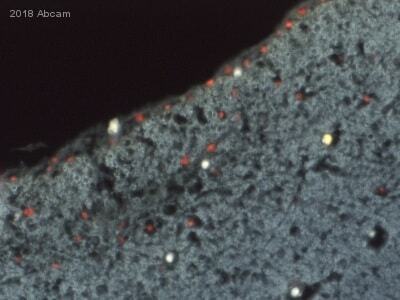 So, in order to detect active Caspase-3, we strongly suggest to induce your samples into apoptotic pathway. Immunocytochemistry/ Immunofluorescence - Anti-Cleaved Caspase-3 antibody [E83-77] (ab32042)Image from Zhu ZX et al., PLoS One. 2015;10(12):e0144495. Fig 7.; doi: 10.1371/journal.pone.0144495. High-glucose induces apoptosis in human Vascular endothelial cells (VECs). 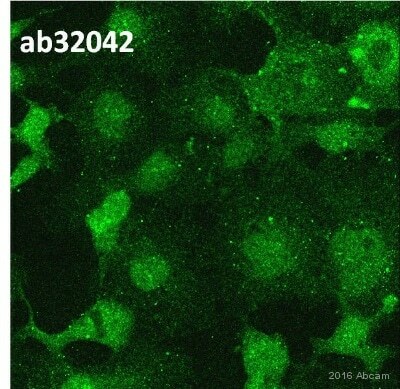 Apoptotic responses in VEC were analyzed by detection of cleaved-Caspase-3 immunofluorescence using ab32042. Cells were treated with low glucose (LG) or high glucose (HG) for 72 hours before treated with 100 ng/mL bFGF, 1 μM sp600125 (sp), or 1 μM U0126 (U) or 10 μM MnTmPyP for 1 hour. Bar = 100 μm. Lanes 1 - 6: Merged signal (red and green). Green - ab32042 observed at 17 kDa. Red - loading control, ab8245, observed at 130 kDa. 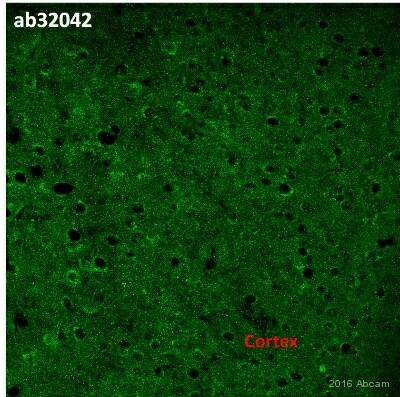 ab32042 was shown to specifically react with CASP3 (Caspase-3) when CASP3 (Caspase-3) knockout samples were used. HAP1 wild-type and CASP3 (Caspase-3) knockout samples were subjected to SDS-PAGE. Ab32042 and ab8245 (Mouse anti GAPDH loading control) were incubated overnight at 4°C at 500 dilution and 1/10000 dilution respectively. Blots were developed with Goat anti-Rabbit IgG H&L (IRDye® 800CW) preabsorbed ab216773 and Goat anti-Mouse IgG H&L (IRDye® 680RD) preabsorbed ab216776 secondary antibodies at 1/10000 dilution for 1 hour at room temperature before imaging. 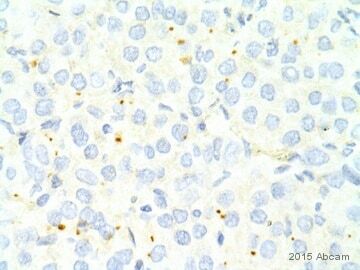 Cells were grown to confluency prior to treatment. Ab32042, at dilution of 1/100, staining HeLa (human epithelial cell line from cervix adenocarcinoma) cells by Immunofluorescence. Additional bands at: 30 kDa. We are unsure as to the identity of these extra bands. Publishing research using ab32042? Please let us know so that we can cite the reference in this datasheet. In the antigen retrieval you suggest the use of a rice cooker. I do not have that machine in the lab and was wondering if I could use an autoclave instead. If so, what temperatures andtimings would you recommend I would set it for? I would not recommend using an autoclave, as this could damage the tissue. I would suggest using a pressure cooker or a microwave. The time and temperature may require some optimization. For the time, I can suggest to try 2, 5, 10 and 20 minutes. For temperature, try 125oC.